A huge Mazel Tov from all of the Ambassador team on your engagement! We are aware that selecting the perfect Jewish wedding band is a big decision and one that you need to get right in order for your big day to be absolutely perfect. 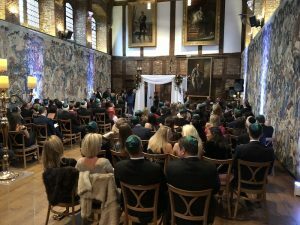 We also understand that there are traditions within Jewish weddings that need to be catered for as well as making sure you also get your own personal musical stamp on the day. Ambassador band have many years of experience in performing at Jewish weddings all over the world and 100% guarantee that the entertainment side of your wedding will exceed any expectations. The band has won many awards for its talents and customer service and can help make your experience a wonderful one, from the minute you book to the end of your wedding day. We are more than happy to work with you to tailor the format of music to your desired itinerary. Over the past decade Ambassador Jewish wedding band has been burning up dancefloor all across the UK and beyond. As a band we have supported Jennifer Hudson, Beverley Knight and been the house band on multiple Rory Bremner chat shows. We have performed for Royalty on multiple occasions as well as celebrities and countless famous brands. 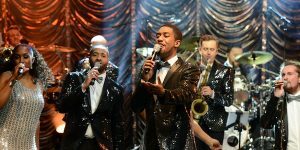 Members within the band have performed on stages with the likes of Joss Stone, John Legend, Jack Savoretti, Florence and the Machine and Emeli Sande to name just a few. We have grown and evolved over the years into a band we are all proud of and now bring a concert style performance to every party and event we perform at. Not only is the band made up of amazing musicians but also amazing performers with fierce energy and stage presence. Our singers and brass section are all very interactive and love to get everyone involved with dance moves, conga lines and even a bit of limbo! Often our singers spend more time on the dance floor than on stage! We also strongly believe that image is everything and we pride ourselves on how we look. We have many different clothing options available and always ensure we look pristine on every event. Take a look at our video page to see for yourself. It goes without saying that you want an outstanding live band at your evening reception party and there are many bands around to choose from. However it is also very important that the band you decide to book has experience in performing at Jewish weddings and more importantly performing Israeli dancing music. A good Simcha band will not only be able to provide great party music for dancing later in the evening, but will also offer a fantastic medley of Israeli Dancing to start the night of with a bang and the option for more Israeli dancing later in the evening if requested. Ambassador band have performed at Jewish weddings for the past 10 years and have specialist fluent Hebrew speaking/singing members, with a vast knowledge and experience of performing all types of Jewish music. Over the years we have honed our craft and built our Jewish repertoire into something magical. Our medleys are exciting and high-octane with outstanding vocal arrangement and killer horn lines that never fail in getting EVERYONE in the room up and dancing. More commonly these days the female members of the band join in with the Israeli dancing and this does add to the overall sound. However we do understand that some Jewish weddings may be more orthodox than other and we are happy to perform this section of the evening with just the male members. 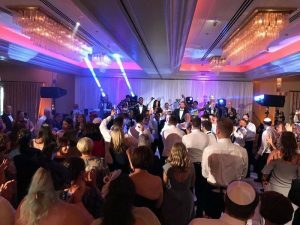 Beyond the Israeli dancing we can also cater for any other specialist music need throughout the evening, including both the English and Israeli National Anthems – God Save the Queen and Hatikvah. Here is a list of some of the more popular Israeli dancing songs we perform on a regular basis – Moshiach, Have Nagila, Siman Tov and Mazel Tov, Ketzad, Chosen Kale Mazel Tov, Yidn, Chazak Chazak, Salam, Od Yishama, Hevenu Shalom Aleichem, Balbeli Otto, Kol Haolam Kulo. 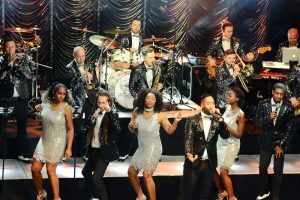 Ranging from a 7 piece up jaw dropping 20 Piece Orchestra Ambassador have the option to tailor the band line up to cater for any clients requests. With an extensive ever growing repertoire of Funk, Soul, Disco, Motown and Pop anthems, Ambassador have something suited for everyone in the set list. We keep our fingers on the pulse and make sure our live sets are exciting and diverse. We want the show to be exciting as it makes a better experience for not only for you and your guests but for us as a band as well. The more fun you have, the more fun we have! As well as being an outstanding bunch of musicians and entertainers Ambassador also come with an amazing team of engineers and crew that will install their state of the art L-Acoustics sound system and intelligent lighting rig at a time that is convenient for you on the day of your wedding. This equipment is all exceptionally pro level and will bring the concert vibe to your wedding day. 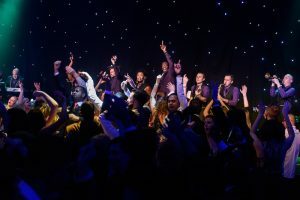 Beyond the sound and lighting that comes as standard with the band we can also provide stages, dance floors and other lighting for around the room on request. Within Ambassador we have musicians that specialise in Chuppah ceremonies. We can offer everything from solo keyboards or/and accordion to a Klezmer trio including clarinet, violin or double bass. One of our musicians can also sing the Jewish music you request in the Chuppah or the musicians can accompany a Chazzan/Cantor of your choice. We would also liaise with your Rabbi before the wedding day to make sure everything was in order with all areas covered. 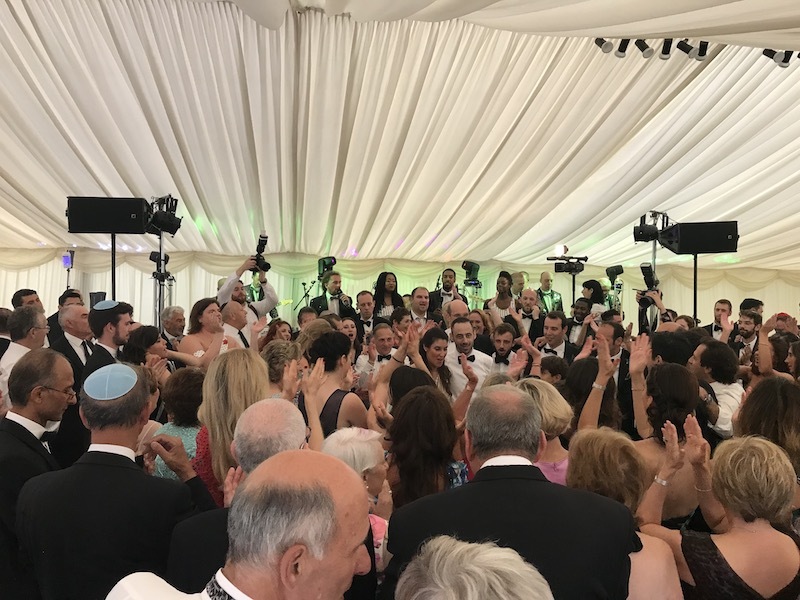 Our musicians would perform for 20 minutes while your guests arrive to be seated, entrance music for the bride and groom, all other parts of the ceremony that requires live music and at the end for Simcha and as you and your guests adjourn to the drinks reception. The band can be completely acoustic if you wish and therefore mobile allowing them to play their instruments whilst leading you and your guests into the reception room and then carry on with another set of Simcha music. If you were looking for live music in the drinks reception then we have lots of different options to choose from. If you wanted a more Jewish feel to the music in the drinks reception then our Klezmer band can cater for this. The musicians can play a variety of Jewish music and can also mix it up with some swing and gypsy jazz if you desired. We are often asked what the traditional format of a Jewish wedding is. The simple answer is that there isn’t one. Every Jewish wedding we perform at differs a little form the last one. Any wedding is a special event designed to meet the requirements of a bride and groom as they come together on their special day and a Jewish wedding is the same. Your Jewish wedding can be as traditional or contemporary as you desire. We can help you mix traditional Jewish dances with contemporary dances. You as the bride and groom should choose what to include in your special day based on how traditional the wedding festivities will be. Modern couples may decide to devote a part of their Jewish wedding reception music to participating in classic traditional dances. This decision will often rest upon the couple’s own wishes, requests from the family or the number of guests who are familiar with more traditional Jewish wedding dances. 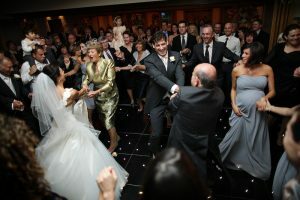 If you discuss your wishes and feelings with us then we can help you decide on the best format for your Jewish wedding. Ambassador band have all of these areas covered and are experienced in performing at all types of Jewish weddings and events. All of our band members understand the traditional aspects involved in a Jewish wedding and endeavour to make the whole day a seamless and memorable occasion. Don’t just take our word for it. Please take a look at our Testimonials page where you can read reviews from our past clients dating back over 10 years. We have also listed a few of the Jewish wedding highlight review below for you. These guys performed at our wedding in September 2018. The process of booking them was incredibly smooth and they communicated brilliantly with us before the day. They let us have input in the set list and were incredibly flexible. They did a stunning Israeli dancing set, as well as their usual fabulous stuff. They really know how to get people up on the dance floor and moving, they are so incredibly tight as a band and each member is outstanding in their own right. Their singers got on the floor with us and really got involved with the guests. They were professional, fun and lively throughout and I’d recommend them for any event you’re planning! I want to thank you for your amazing work at our wedding. Your music made the party great. The horah was wonderful and you played so many of our favourite songs. Also, Geoff’s meticulous planning in advance really inspired confidence in the months leading up to the wedding. We appreciated all the organization. I would recommend your band to ANYONE looking to hire one. In fact, one couple at the wedding that’s looking to get married said they would seriously consider hiring Ambassador because you did such a wonderful job. THANK YOU! Wow Ambassador, where do we start. The ultimate super band! Professional, talented, entertaining and incredible. My new husband and I couldn’t be more pleased by the way Ambassador got everyone up on the dance floor ALL evening!!! They listened to exactly what we wanted from music for our ceremony to the type of music for the evening. We also requested Ambassador to learn a traditional Sicilian song, which they leant and played brilliantly. Geoff has been trusting and helpful from the word go. This is not just a wedding band but a show band! To have them play at our wedding was the best decision ever and we highly recommend them as a top quality band. Everyone at the wedding was raving about them! 10/10. Thanks to Geoff and the Team. Getting the music right is such a crucial part of a wedding but we got it spot on when we contacted you. From the beginning you were so flexible and friendly offering a truly personalised service. The fact that you made sure that every detail was just right totally put us at ease and meant that we knew we were in safe hands. I knew we would have great party! What a party it was…. everyone commented on the musicianship but also how right for us it was – you really captured what we were trying to create. From the first burst of music everyone was hooked and the quality kept coming. Awesome, Amazing and Incredible were words that I constantly heard people describing you as, everyone was so impressed. I kept looking around at the full dance floor and smiling, and the fact that everyone was shouting for more at the end was more than we could have hoped for. Anyway I could go on all day – thank you so so much for working so hard to make our day so special – you really were a crucial element of the day, We were really lucky to find you! Please email us with details of your enquiry including date, location, estimated room size and approximate number of guests.